THE WOMAN FROM BRATISLAVA is a long but rewarding book, both exciting and serious. Written and set in 2000, but only published in English ten years later, it assesses the conflict in the former Yugoslavia in the light of the Second World War and the 1989 fall of the Berlin Wall (with the associated collapse of Communism), with a Danish perspective. The author is a journalist, so part of the novel is almost a non-fiction account of the bombing of Serbia which happened almost simultaneously with Poland, the Czech Republic and Slovakia joining NATO. The author applies his journalistic knowledge and experienced writing style to make sense of a conflict that, at the time and subsequently, seemed very confusing and obscure from the outside. Leif Davidsen conveys with genuine emotion how the NATO bombing raids against Milosevic devastated a country, causing thousands of refugees to flee to the hopelessly overburdened and primitively impoverished country of Albania, and as conflicts across new political and religious boundaries set individuals, families and local communities against each other. These middle-European national boundaries are also to the fore in Davidsen's treatment of the Second World War. The author looks straightforwardly at his own country, Denmark, and its enthusiastic embrace of Nazism at the beginning of the war, when Germany was dominant on the mainland and many Danish soldiers enlisted in the German forces, many of them fighting for the Nazis in Yugoslavia, Russia and elsewhere. Later in the war, when it became clear that Hitler was losing, Denmark turned on its former military heroes, branding them as traitors and attacking or ostracising their families. History was rewritten so that even today, the Danish role in the war is considered as a noble resistor of the Nazi evil, and those who supported the other side have been shamed and had their stories suppressed. Rather than presenting the reader with a political tract to demonstrate how this old cover-up still infects Danish, and European, relationships today, Davidsen tells the story of a family that has been critically affected by these conflicts. It gradually emerges that Pedersen the baker, the father of 50-something Fritz (also a baker), Irma and the much younger Teddy, academics at the University of Copenhagen, was part of this Danish Nazi force. After fighting for the Germans he returned to his village bakery business when peace was declared. All was well until a grand shooting party in 1952, when he was recognised by one of the guests for what he was - a man who had participated in dreadful atrocities when fighting the partisans in Yugoslavia - and hence was ostracised by everyone who knew him, and his business ruined. He abandoned his young family and disappeared. Soon after, a body was discovered in Hamburg harbour, carrying his papers. He was declared dead. Teddy knows nothing of these events, as he was a young boy at the time and his mother subsequently remarried. At the start of the novel, he's a relatively unsuccessful academic, never having obtained a professorship, and as far as he is concerned his father was a headmaster at a local school. (Incidentally, the author's portrait of university in-fighting and mores is beautifully observed.) When on a cultural lecture tour of central Europe, however, Teddy is visited in his hotel room in Bratislava by a woman who claims to be his half-sister. She tells Teddy about how their father, far from being drowned, in fact lived in Yugoslavia with a woman with whom he had had a relationship while in German army, and that she is their child. Teddy is initially disbelieving of this news, but the likeness of his visitor to his own sister Irma forces him to accept that her story may be true. In another thread of this narrative, Jytte Vuldom, head of the Danish secret service, is aware via the release of the Stasi's documents that there is a spy who has been betraying her country's secrets to the Russians, and maybe others, for many years. She employs Per Toftlund, the agent whom we met in the author's previous novel, THE SERBIAN DANE, to help her find conclusive evidence that the person who has just been taken into custody and accused of this crime is, in fact, "Edelweiss", the spy's code name. Per has other things on his mind, however: he is now married to Lise and they are about to have their first child. Nevertheless, he takes off on a trip round Eastern Europe to try to find evidence to identify and implicate Edelweiss within the 21 days the courts have allowed before the prisoner must be either charged or released. In the process, we learn a great deal of the history of middle-Europe since the War, and how Nazism's shadow has cast a pall that has lasted until the present-day, aided by the smug hypocrisy of countries like Denmark, which would prefer to brush their support for fascism under the carpet rather than openly examine it. Edelweiss's side of the story is told via an imaginary letter, in which the reader sees events from the end of the war to the present as they were perceived from the other "side". 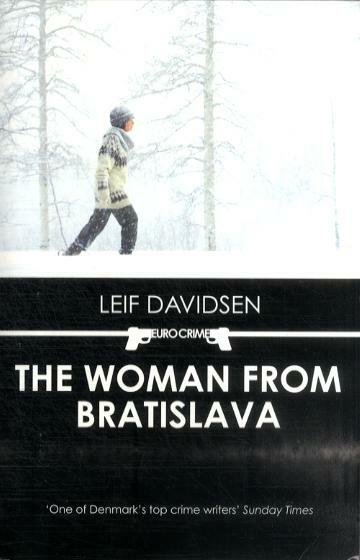 THE WOMAN FROM BRATISLAVA is a long and complicated novel. I thoroughly enjoyed reading it, though I felt the first half, with its strong characters and focused narrative, was better as a novel than the second part, in which Per travels to Poland, Slovakia, Albania and Hungary in an increasingly confusing and multilayered attempt to unravel the story of Edelweiss and the many spy networks of betrayal, double and triple cross that are at the heart of the mystery. By far the best parts of the book are the sections in which Teddy tells his story (the start of the novel) and later, Irma, his elder sister's, testament. Irma's account of her teenage years immediately after the War, and how her actions were influenced by events surrounding her father, is a superb piece of storytelling, as we see how her political convictions affect her academic career and her choices when the Berlin Wall falls, 10 years before this novel is set. There is a similarly strong section in which Teddy meets a mysterious family, learns some unwelcome truths, and is shocked by a 'museum' he is shown. Per is, I presume deliberately, a not terribly sympathetic character who nevertheless understands more about human nature and failings by the end of the novel than he does at the start, as a result of some of the terrible events and violence he witnesses, and the betrayals that he understands only too late. The novel's climax occurs in one of the refugee camps in Albania, and we are left in no doubt about the suffering that so many people have to endure, in the name of false idealism. The spy and secret-service aspects of this convoluted novel do not really integrate coherently with the human-interest elements. I am happy to read a book that has loose ends or ambiguities, but I felt that the conclusion of this one is a bit too confusing and "up in the air" after all the long build-up and the reader investment required in terms of time and concentration to get to the end, which seems a little over-hasty. Overall, however, I highly recommend THE WOMAN FROM BRATISLAVA as a sincere and ambitious attempt to discover and convey why central Europe is so fatally conflicted, reaching back into the history of the twentieth century (but not before). Much of the novel is a truly magnificent achievement both of narrative and of writing style - the translation is marvellous. By the end of the book, I understood more about the Balkan conflicts of the past century than I had previously, including their human costs. If parts of this novel did not work as well as the rest, I can forgive it, for its sincerity and its honest attempt to both tell a good story and to provide a strong moral message.